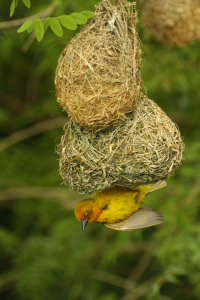 Gareth Robbins of Golden Orb Tours has started a blog on Cape Weavers in Plettenburg Bay. Gareth has also registered his local Cape Weaver colony for PHOWN Repeats, and will submit weekly PHOWN updates of his colony, so that the number of nests in the colony can be tracked through this breeding season. For additional information about Cape Weavers in the Plett area, read Gareth's blog and add comments if you like. Photo (right): one of Gareth's Cape Weaver PHOWN submissions, phown 1582. Note: at the bottom of this PHOWN record is a list of all the counts of this colony, showing how it changed over time. Previous news item about Golden Orb Tours - read here.